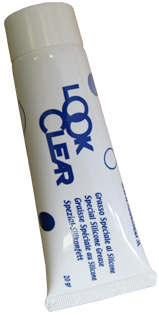 Silicone based grease especially designed for use in marine environments. It lubricates and protects equipment and surfaces subjected to low or high temperatures, on which high pressures act. This product is used in diving equipment to prevent corrosion of metal parts (zip and knives, etc…), to lubricate and protect hose connectors, gaskets, threads, O-rings and rubber parts. • Preserves rubber, plastic and metal. • Strong resistance to oxidation and repels water. • Remains pliable even after extended use. Apply directly to rubber parts to be treated with fingertips or other applicator. Reapply when rubber parts or components become dry. Do not over apply.